As determined as I am to go through every single recipe in this book, all these yummy treats might be affecting me physically. I think I'm putting on a few so I cut this recipe in four just so i could try it. I don't need two large pie sitting in my fridge pressuring me into eating them so I 'don't waste food'. Blueberries with lemon, sugar and cornflour this was a pretty simple recipe. 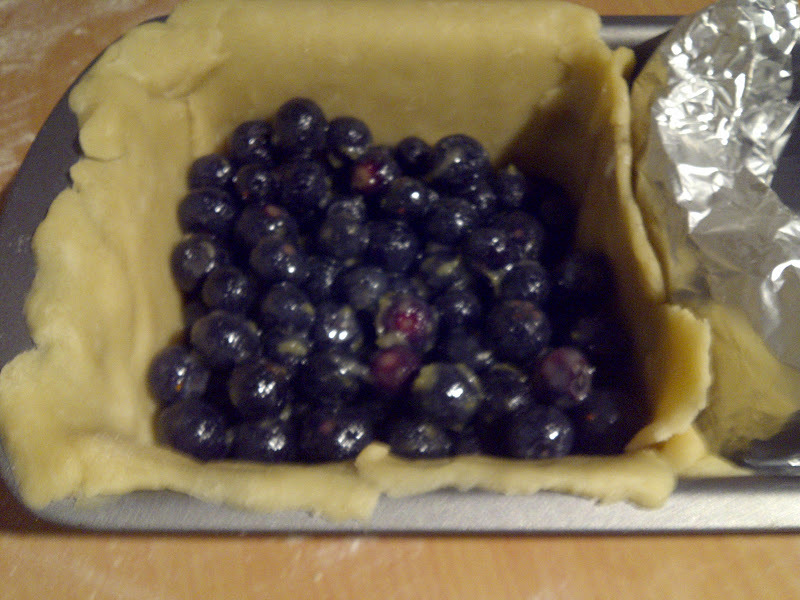 I moulded a pie base for this filling in half of a loaf pan and used some folded foil to support it. After sealing it, i stabbed the top twice to let out steam during baking. It was oozing this beautiful purple juice as it baked. Its amazing how this rich colour comes out of such dull blackish purple fruits. On the other hand, the flavour of this fruit is not as rich. Thank you so much Bella! Glad you love it, please keep on loving it :). I appreciate your comment and apologize for how late this reply is, i was having some technical issues.